Located northwest of Vineyard Haven, in Martha's Vineyard, marking the western side of the entrance to the harbor. West Chop was primarily a sheep pasture until it grew into an exclusive summer resort in the late 1800s from the booming business of whaling and fishing trades. Captain James Shaw West, a long-time resident of the town, was hired to be the first keeper of the light. Keeper West and his wife Charlotte were the parents of nine children when they moved into the lighthouse, where they had two more children while stationed there. Keeper James West served for nearly three decades at the West Chop Lighthouse before resigning in 1847. He was replaced by Charles West (not a son of James). 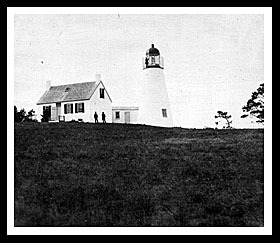 Charles West stayed at the lighthouse until 1868, when his son, also named Charles, succeeded him. Charles, Jr. served until 1909, as this father and son made their combined stay at the lighthouse for 62 years. In 1877, a schooner carrying a load of bricks ran aground near the lighthouse in 1877, where the captain had the crew throw tons of bricks overboard so the vessel could float. The bricks were observed for many years on the bottom at low tide. 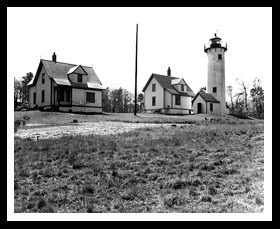 Because so many large houses were being built by wealthy business people, sea captains, and the like in the late 1800’s, mariners were having trouble viewing the lighthouse. Petitions were gathered asking for a new higher tower to replace the old tower, which was constructed in 1896. Vineyard Haven, also known as and is incorporated by Tisbury, is a quiet resort community on the northern shore of Martha's Vineyard with many elegant homes built by the wealthy in the 19th and 20th centuries, along with fine restaurants, specialty shops, and great views of Vineyard Haven Harbor. For those who want to camp on the island visit the Martha’s Vineyard Family Campground in Vineyard Haven. Following West Chop Road, you can take photos of the lighthouse from the street, but the grounds are private property. The Martha’s Vineyard Film Society hosts a series of events for visitors. In West Tisbury nearby, you can relax at the Polly Hill Arboretum known as Martha’s Vineyard’s “horticultural and botanical landmark”. For those who are interested in horseback riding, you can find riding lessons at the Arrowhead Farm. West Tisbury has a year-round scheduled plane service to the Martha’s Vineyard Airport from Boston, Hyannis, Nantucket, New Bedford, and Providence named Cape Air Travel travel. From the Vineyard Haven ferry landing, go west on Union Street and then turn right onto Main Street. 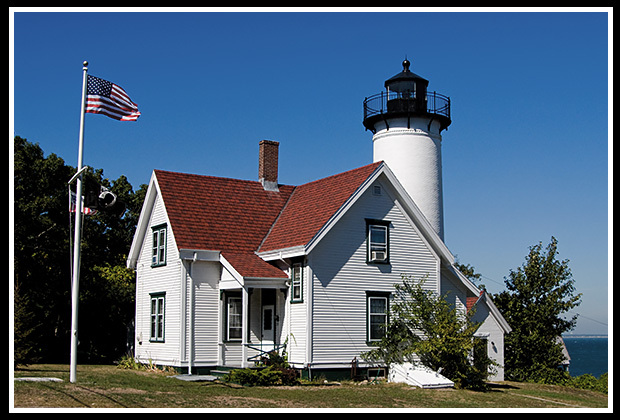 Main Street will become West Chop Road, which will lead you to the lighthouse that you will see on your right. Viewers can take photos from the street, but the grounds are private property. Most of the ferries mentioned don’t pass by the lighthouse, but provide services to get to the island of Martha’s Vineyard, or between the islands. Boat cruises and ferries mentioned below may offer many types of cruises. 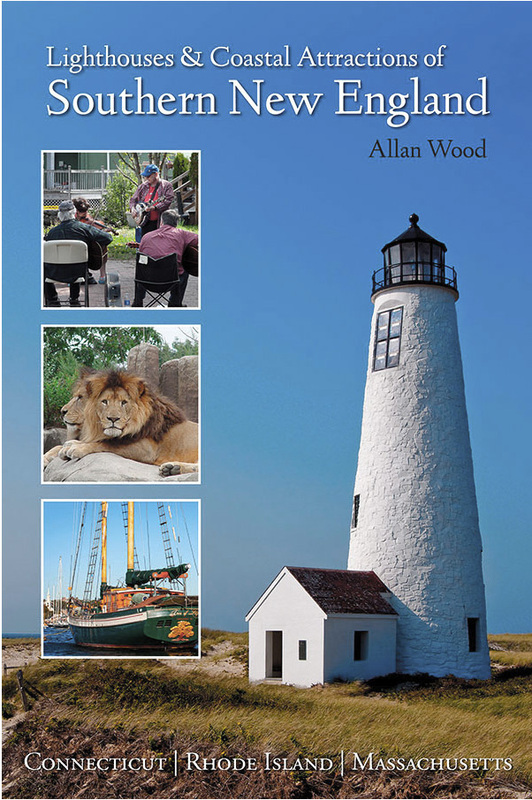 My 300-page book, Lighthouses and Coastal Attractions of Southern New England: Connecticut, Rhode Island, and Massachusetts, provides special human interest stories from each of the 92 lighthouses, along with plenty of indoor and outdoor coastal attractions and tours. Lots of photos and map illustrations. ©Allan Wood Photography, not for commercial use, personal use only. Do not reproduce without permission. All rights reserved.